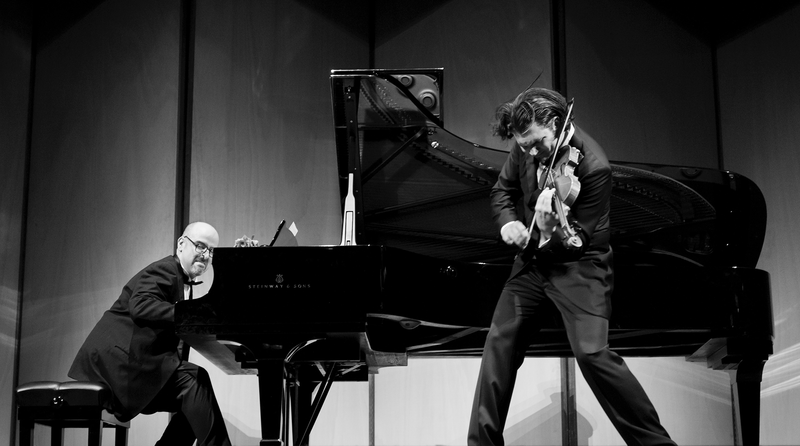 The musical comedy team, Duo Baldo, is comprised of renowned violinist Brad Repp and pianist/actor Aldo Gentileschi. Their critically acclaimed performances combine virtuosic performances, theatrical humor, and pop culture. Duo Baldo made their debut with Italian tenor Andrea Bocelli in 2004. Competition in Florence. After winning first prize at the 2009 Musicomicontest, they performed at the opening of the 2010 Salzburg Festival. Other engagements include the Chamber Music Society of Trieste, as well as appearances in Shanghai, Tokyo, Brescia, Baltimore, Cincinnati, Los Angeles, Livorno, Lucca, Lugano (Switzerland), Mexico City, Paunat (France) and Prato. In September 2011, Duo Baldo performed a gala concert on Giacomo Puccini’s recently-restored Steinway piano with soprano Maria Luigia Borsi at the Teatro Giglio in Lucca. Violinist Brad Repp has appeared as violin soloist with José Carreras. He performs on a 1736 Testore violin. Aldo Gentileschi performs on whatever piano he can find.